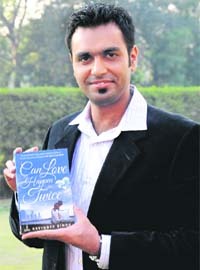 Ravinder Singh Article in "The Tribune"
Another Newspaper "The Tribune" have post published a post in their newspaper about Ravinder singh after the success of his 2nd Novel "Can Love Happen Twice" which got published after the first national best seller "I Too Had a Love Story". It has been 10 days since the 2nd book is out and it has been a smashing hit among young generation, which we can see on Ravinder Singh's Facebook wall. Read the exclusive report of "The Tribune" here.